The Jones Cup is a 36 holes of team stroke play tournament featuring players from the 18 colleges and universities accredited by the PGA of America for aspiring PGA Professionals. The PGA Jones Cup was initiated by Mississippi State University in 2002 and this year will mark its 17th anniversary. Five PGM students from each university compete in a 36-hole team format. The event serves as a unique platform for students to display the utmost in professionalism, integrity, character and camaraderie. The Jones Cup held in Port St. Lucie, Florida is a tournament held among the 18 PGA accredited universities. 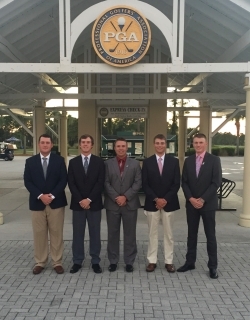 These five students qualified through our tournament program and represents a great opportunity for PGA Golf Management students to stay competitive. Tanner Staples was EKU’s best finisher at T18 out of 90 players with a two day total of 8 over par (80, 72).